A network security breach (a hack, crack, or other invasion) occurs when unauthorized access to the network is achieved and havoc results. The best possible defense is an offensive strategy that allows you to regularly test your network to reveal the vulnerabilities and close the holes before someone gets in. 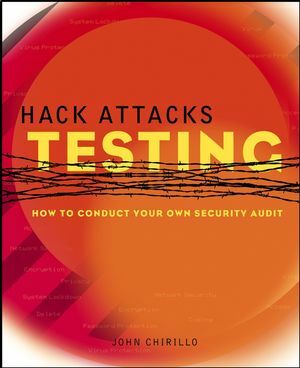 Written by veteran author and security expert John Chirillo, Hack Attacks Testing explains how to perform your own security audits. The CD contains virtual simulations of scanners, ISS Internet Scanner evaluation version, and more. JOHN CHIRILLO is Senior Inter-networking Engineer at ValCom, a technology management company in the Midwest. John holds numerous certifications including CCNA, CCDA, CCNP, CISSP, Intel Certified Solutions Consultant, Compaq ASE Enterprise Storage, and Master UNIX certifications, among others. John has more than ten years of experience on various computer systems and more than five years of training experience. John is the author of five Wiley books, including the Hack Attacks Series. PART 1: BUILDING A MULTISYSTEM TIGER BOX. Chapter 1. Basic Windows 2000/Windows 2000 Server Installation and Configuration. Chapter 2. Basic Linux and Solaris Installations and Configurations. Chapter 3. Mac OS X Tiger Box Solutions. Chapter 4. Installing and Configuring a Testing Target. PART 2: USING SECURITY ANALYSIS TOOLS FOR YOUR WINDOWS-BASED TIGER BOX OPERATING SYSTEM. Chapter 5. Cerberus Internet Scanner. Chapter 8. Security Threat Avoidance Technology Scanner. PART 3: USING SECURITY ANALYSIS TOOLS FOR *NIX AND MAC OS X. Chapter 11. Nessus Security Scanner. PART 4: VULNERABILITY ASSESSMENT . Appendix A. Linux/Unix Shortcuts and Commands. Appendix B. What's on the CD-ROM.